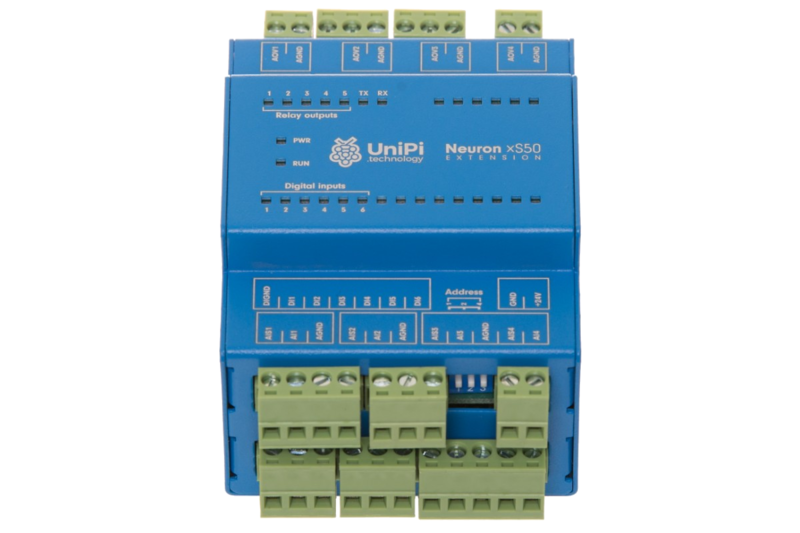 Neuron xS50 is an extension unit for Neuron controller units allowing you to further extend your automatization network with additional I/O’s. 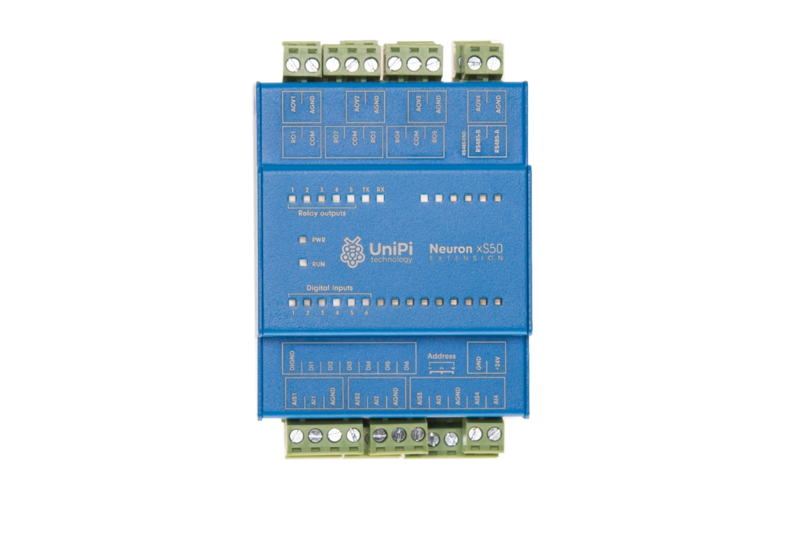 The Neuron xS50 is an extension modul for the UniPi Neuron PLC product line. 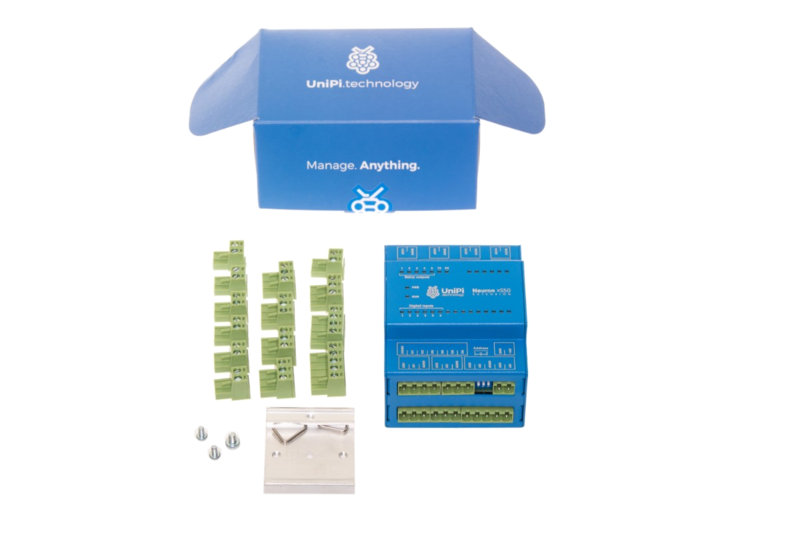 This module allows for an easy extension of existing automated networks without the need for purchase of additional control units. Extension modules are based on the Neuron S103 control unit, but lacks the Raspberry Pi computer, which was replaced by an additional I/O group. The module features its own processor, allowing it to operate independently on the master control unit. resistance measurement (from sensors PT100, PT1000, NTC) in three wire (three conductors, 0-100 Ω, 24bit resolution) or two wire (two conductors, 0-1960 Ω, 24bit resolution) wiring method. Digital inputs (DI)are designed for reading of binary values (0/1, on/off, open/closed etc.) and are thus suitable for connecting switches, motion sensors, window or door magnetic locks etc. 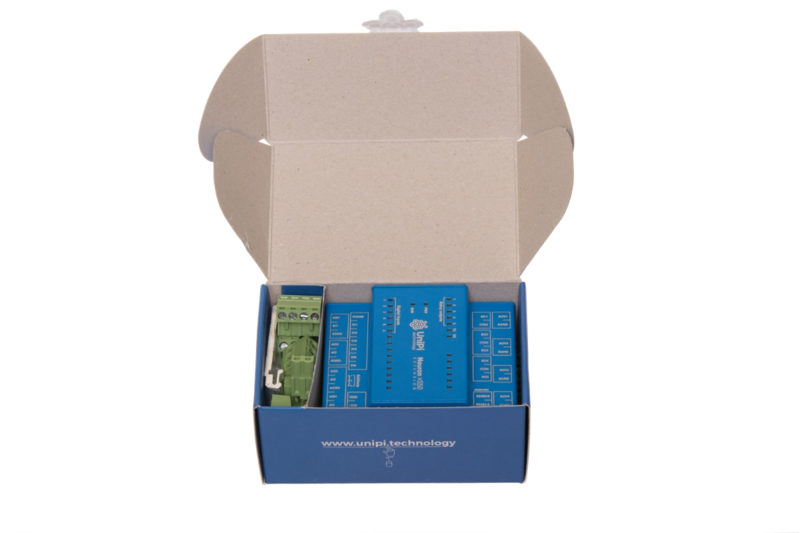 Digital outputs (DO) can be used to control binary state devices, such as lightning switches, window shutters control, remote door control etc. Analog inputs (AI) are used to receive either 0-10V voltage or 0-20mA current signals. Alternatively, they can be used for reading data from corresponding sensors, such as resistance thermometers. The user can adjust the input mode via corresponding control software. Analog outputs (AO) are used for control of external devices such as three-way valves or heat exchangers via 0-10V voltage or 0-20mA current signals. Analog outputs allow current or voltage regulation - alternatively, Group 1 inputs can be used in combination with resistance thermal sensors. Relay outputs (RO) are designed for switching two-state devices via alternating or direct voltage. 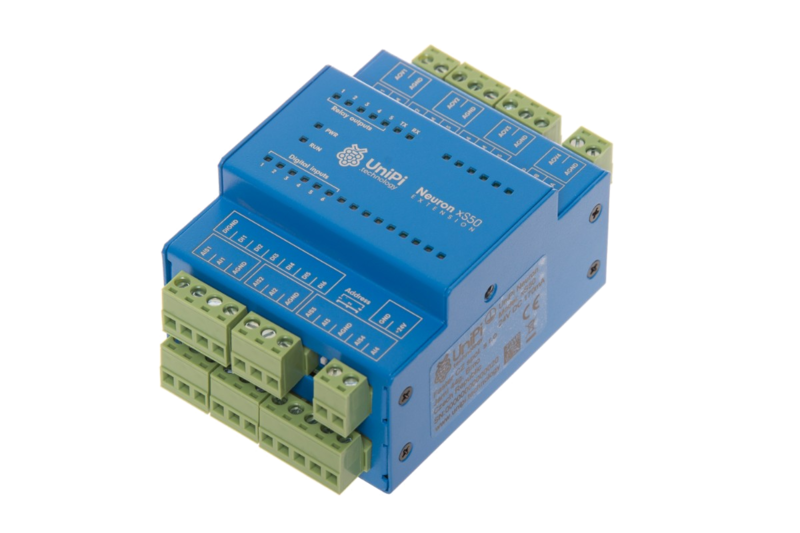 Relays thus can be used to switch boilers, water heaters, electric motors or other stronger relays. 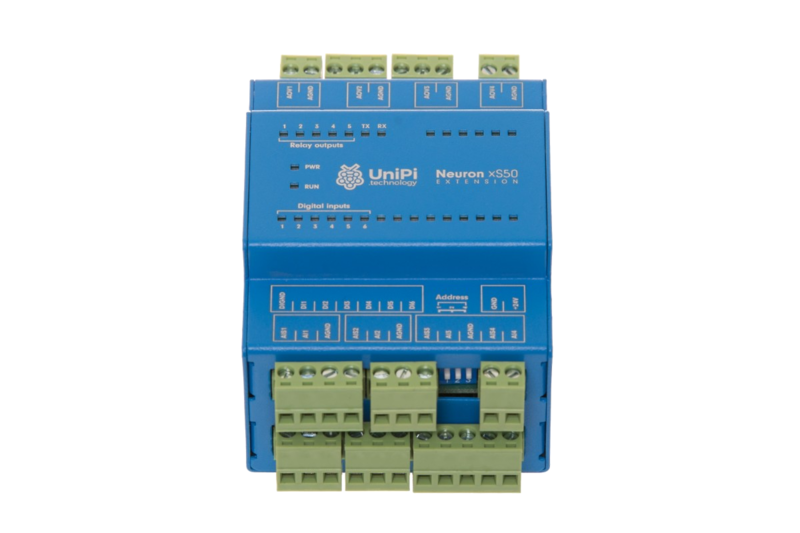 Neuron unit relays are designed for 5A maximum current and 250V alternating/30V direct voltage. Along with standard I/O functionality, the xS50 offers several functions to enhance the module's performance and to allow it to react to critical events. DirectSwitch is a group of functions allowing for a quick output response for input state change or an input event. The response is processed locally by a module's processor without any communication with the master control unit. As a result, the total response time is very low. 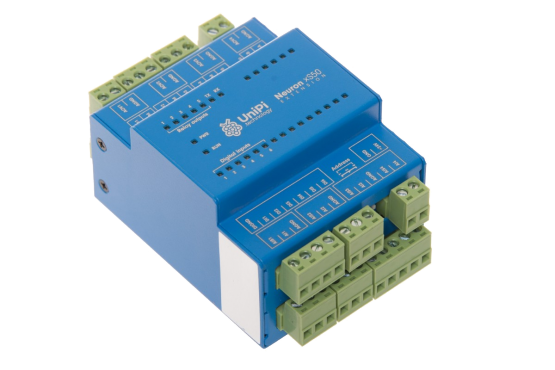 The DirectSwitch is thus suitable for time-critical applications such as lightning control. An option to save default settings allows each processor to save its default configuration. This configuration is then loaded after every device reboot triggered either by manual restart or by power outage. The MasterWatchdog feature monitors the communication between CPU and local processor. If no exchange occurs within a pre-set timeframe, the MasterWatchdog automatically resets the device and I/O modules back into default settings. 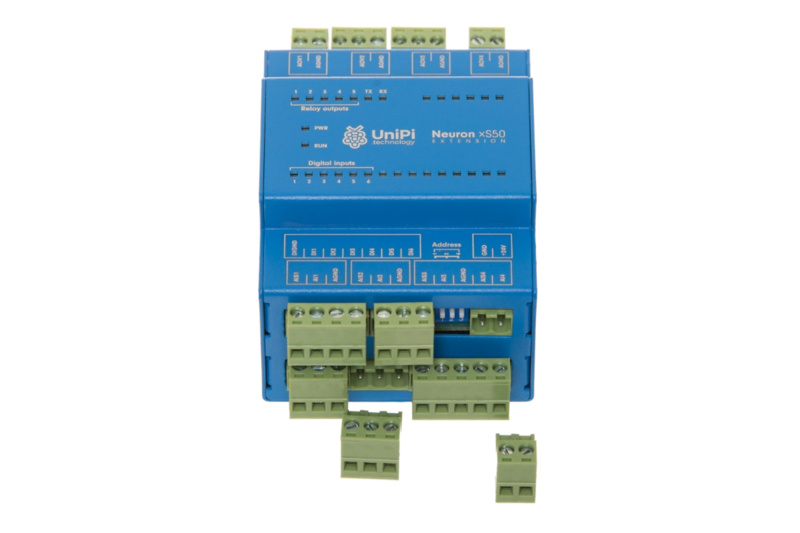 Addressing of the extension module can be done either via control software running on the remote master control unit or can be set manually via integrated DIP switch. The DIP switch allows the user to set up to 4 bits of address and is evaluated in preference to software settings. If the address on DIP switch is set to “0000”, all DIP switch settings are ignored and the software settings take priority. For more information about addressing and other product features please review the product manual.